Hoboken's new mayor is in the spotlight but it's not in his favorite position as media celebrity victim. 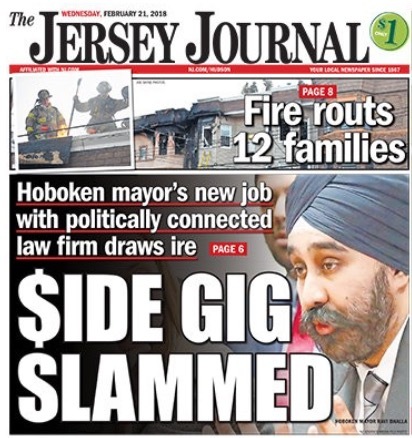 The Jersey Journal joined the Hudson County View and MSV in highlighting the criticism across Hoboken and the majority of the City Council who yesterday voiced detailed concerns and problems with the new Mayor Ravi Bhalla "side hustle." Hoboken Mayor Ravi Bhalla has taken a job with a politically connected law firm, leading to attacks from council critics who say the side gig raises potential conflict-of-interest issues. Tonight, the City Council may attempt to find out the particulars of the Mayor Bhalla broken promise in leaving one law firm and signing up with another after the election. The public interest in this story exploded during the holiday weekend as traffic rose with the spreading news Mayor Ravi Bhalla had developed a revenue stream apparently using the office of mayor as the hook. Defenders of the new mayor have been few and far between. It's been four days of anger, concern and questions as political observers in Hoboken seethed over the holiday weekend with Mayor Bhalla claiming he's entitled to cash in with a new law firm gig of unknown total value. Bhalla's campaign spokesman emerged over the weekend pointing to some undeterminable salary under $100,000 but there's no telling how rich the revenue stream may turn out to be with the new law firm, Lavery, Selvaggi, Abromitis & Cohen. What is the total potential value of this contract for Ravi Bhalla? How many similar side-hustle law firms may seek out the new Hoboken mayor for "strategic advice?" These questions are in the starter kit for the public and City Council. The next City Council meeting begins tonight at 7:00, sharp. Talking Ed Note: The whispers in the campaigns last year about ethics or concerns for same have reared their head and early. Reap the whirlwind. Notice, a few Ravi Robots finally emerged after days of silence to dismiss the public outrage even without any public accounting on the total potential value of the Ravi Bhalla "side-hustle" with another law firm. Putting aside the obvious scam on the public, trading in one law firm's payday with another; the lack of interest in the obvious potential for conflicts there belies the fanaticism and betrayal to the detonated Reform Movement. Waving off basic public accountability in a law firm rich deal of unknown value unmasks them as both traitors to Reform and good governance. Thankfully, some public officials and the public have begun raising their voices. Ring the bell. Ring it loud and proud - for Hoboken.